Chaat is the common term used for mouth watering street food in India. It has many varieties as gol guppe or pani puri, sev puri, dahi puri, chole tikki, papdi chaat, bhel puri. 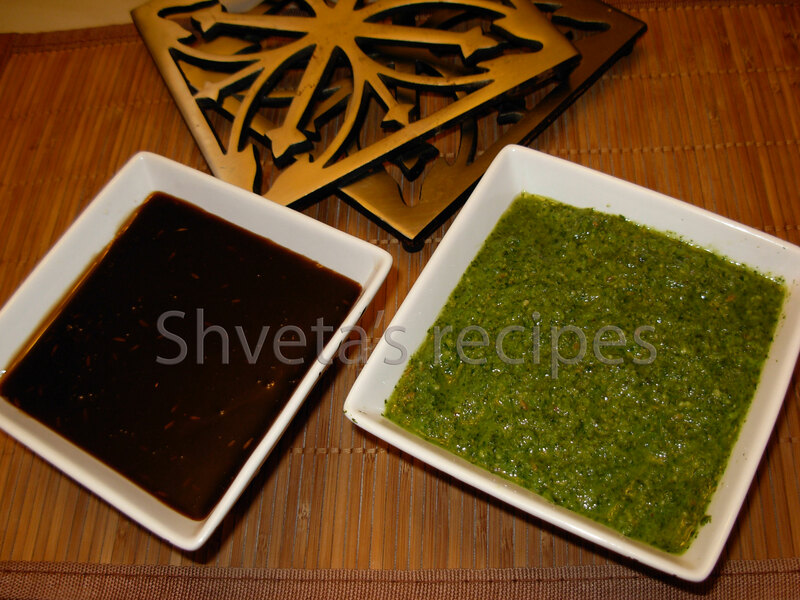 All of them has common mint-cilantro (green chutney) and tamarind (sweet imli) chutney. 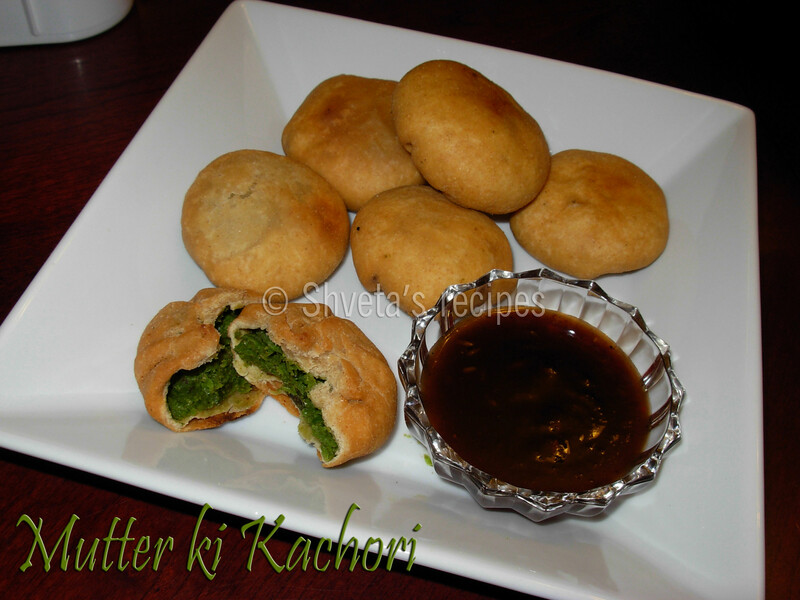 If you have all the ingredients, these chaats can be prepared in jiffy. I always keep green chutney and tamarind chutney ready in my refrigerator so preparing chaat is very easy. 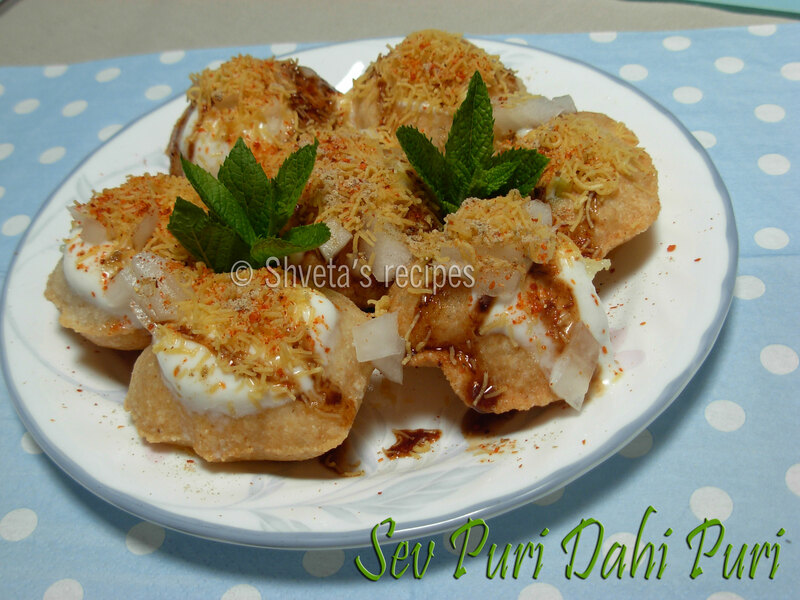 The recipe here is for Sev puri dahi puri also called as SPDP, in Pune, India. I’m using store bought pani puri shells. They are as good as home made ones; sometimes even better:). These shells are versatiel, can be used with pani to eat as golguppe/ pani puri or can be prepared as sev puri dahi puri. 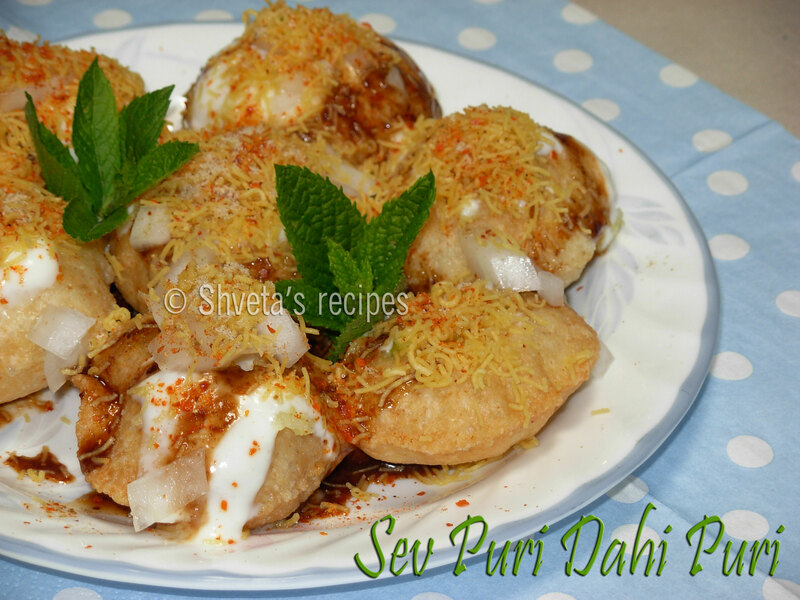 The same recipe is also called sev batata puri beacuer the pani puri shells are filled with boiled potatoes. 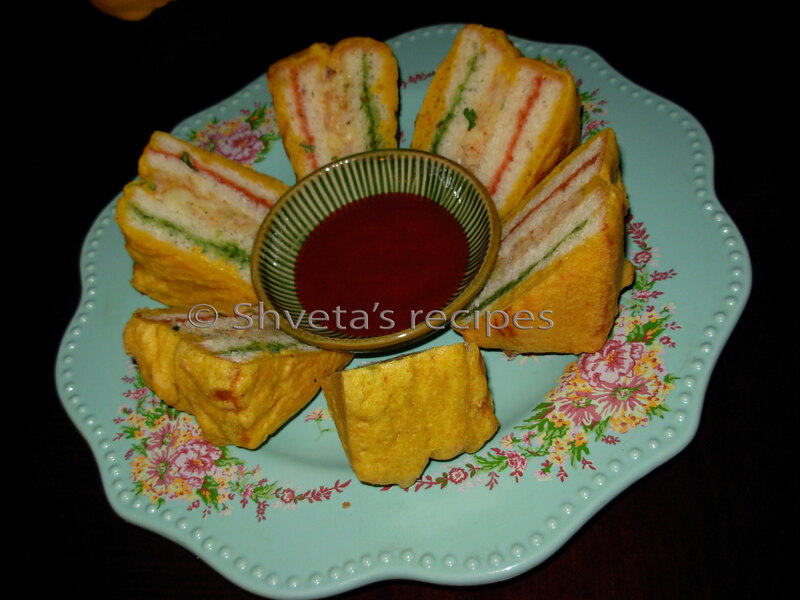 Enjoy this lip smacking snack. Boil and peel potatoes. In a bowl, mash these potatoes roughly and add chaat masala and salt. Mix and keep aside. Finely cut sweet onions and fresh cilantro, keep aside. 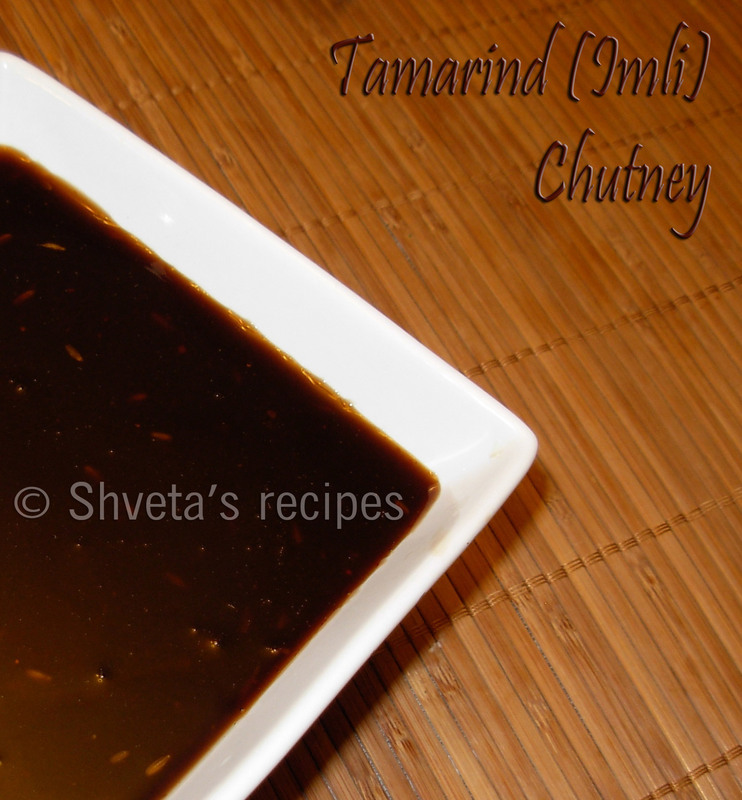 Prepare tamarind chutney and green chutney as directed. Keep aside. In a bowl, take yogurt; add some sugar and salt. Mix well. Keep aside. 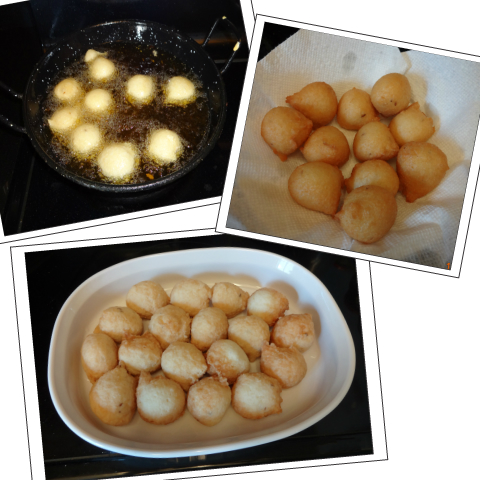 Now for final chaat assembly; first take puffed plain golguppe or Pani Puri and make a small hole in each of them. Fill each puri with boiled potatoes. Keep 6 Pani Puris in each plate. Add a ladle full of smooth yogurt mix on these puris. Now add a tsp tamarind chutney and green chutney on each puri. Top it off with chopped onions and fine namkeen sev. Finally garnish with fresh chopped cilantro, chaat masala, red chili powder and salt. 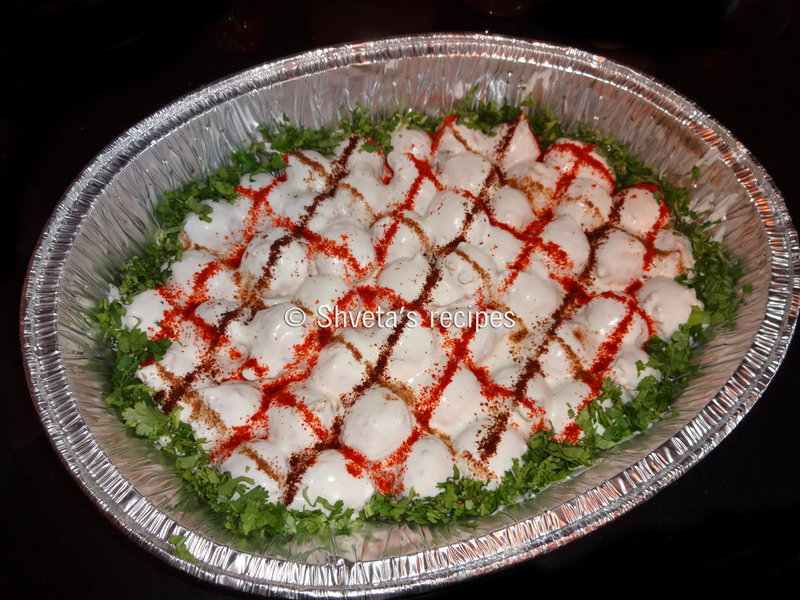 Enjoy this mouth watering chaat as soon as assembled, or it will get soggy. 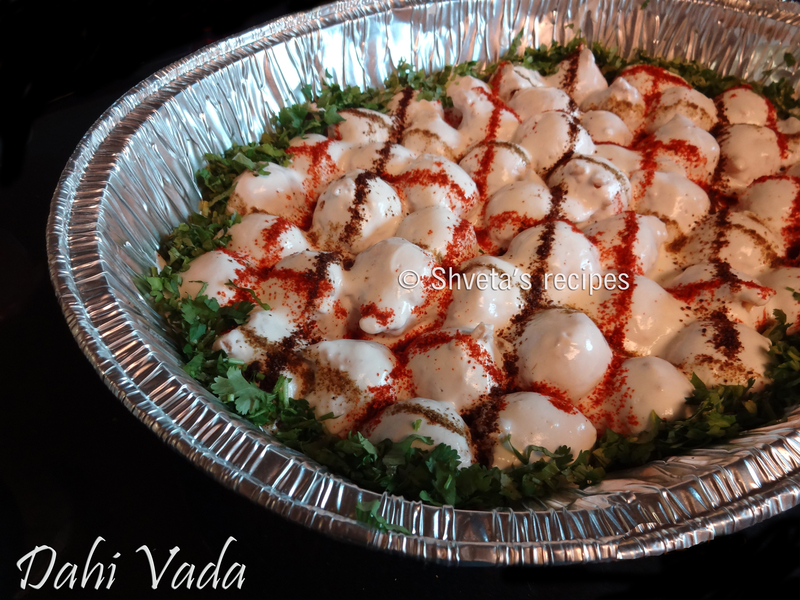 In a bowl, prepare stuffing, by adding boiled and peeled potatoes, Onions, green chilies, cilantro, roasted cumin powder, red chili powder, amchur powder, chaat masala and salt. Mash it all together. Keep aside. Take one bread slice, apply a thin layer of ketchup on it . Cover it with another bread slice. Now apply a layer of potato stuffing on it. Cover with another bread slice. 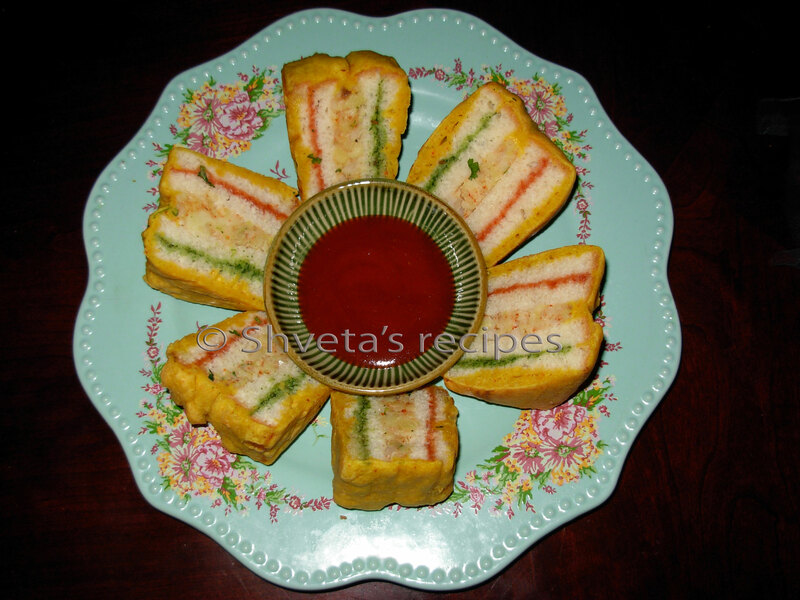 On this slice apply a thin layer of green chutney and finally cover it with a bread slice. 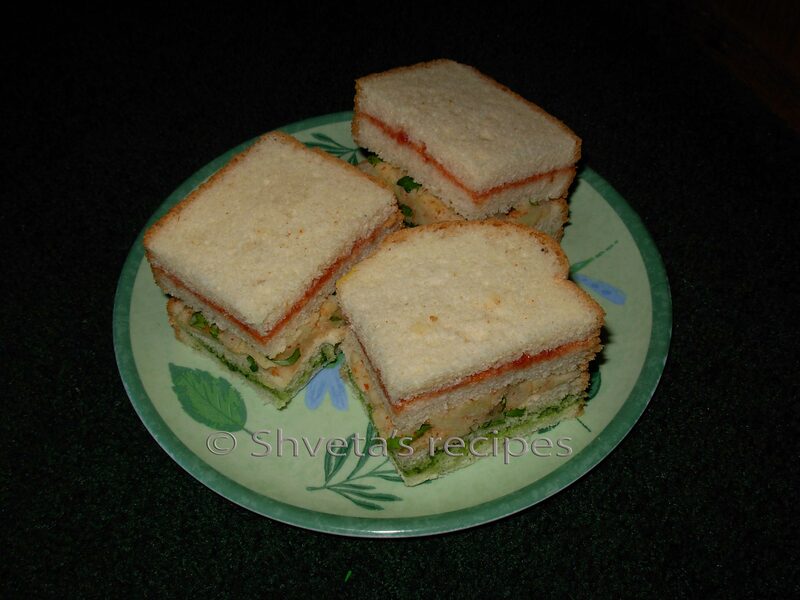 The whole sandwich should have following layers: Bread – ketchup – Bread – Potato stuffing – Bread – Green chutney – bread . Cut the whole sandwich in 4 quarters. Quarters are easy to manage while frying. Keep them aside. For the covering batter: In a bowl, take besan, red chili powder, turmeric powder and salt. Mix well. Now add some water to make a smooth batter. Batter should not be runny. Now take each sandwich quarter, dip evenly in the above batter and fry it in medium hot oil. 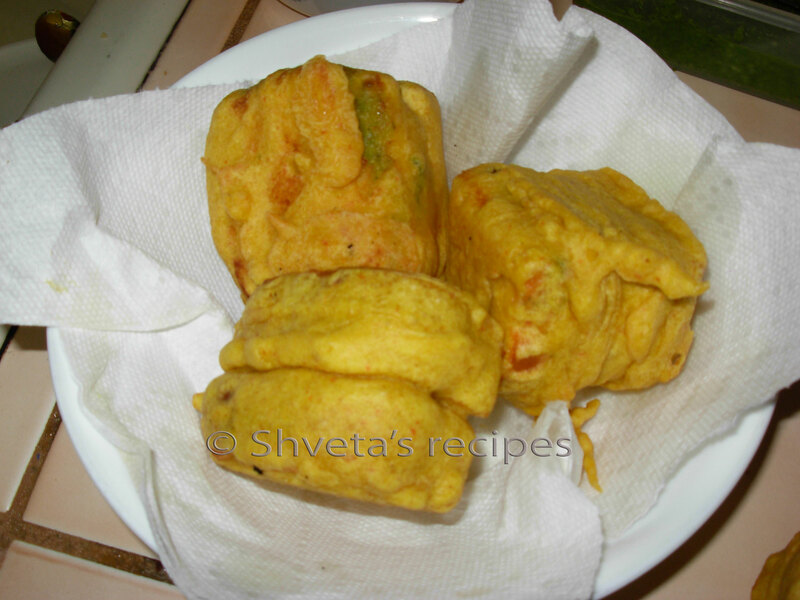 When the pakoda looks evenly golden on all sides, take it out and drain it on the kitchen towel. Let it cool a bit. Now cut it diagonally to reveal all the layers. Enjoy with a cup of hot tea or cool lemonade. Rainy or gloomy weather calls for something hot, something crispy. 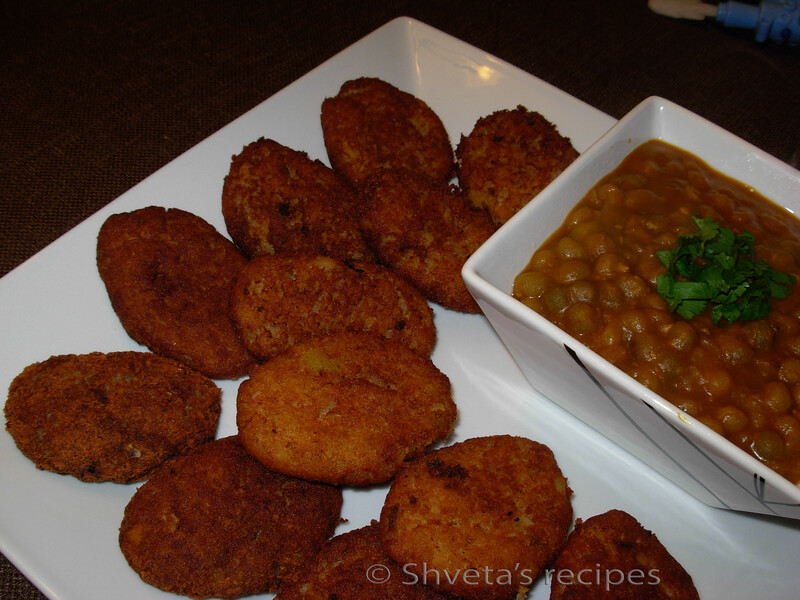 What will be the better option than Spicy Fritters: Garma garam bhutte ke bhajiye with a cup of tea. 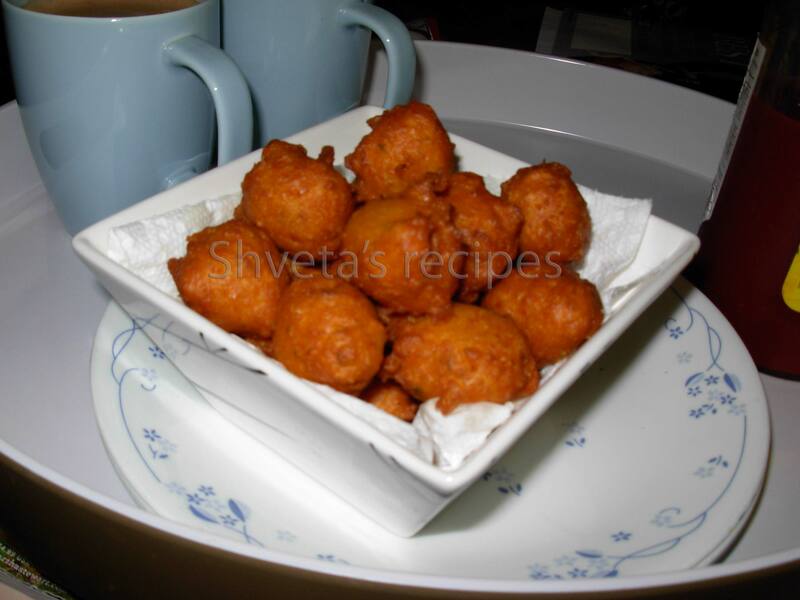 Enjoy this easy recipe for corn fritters. Thaw frozen corn kernels in microwave for 2 minutes. For fresh corn, carefully cut the kernels using sharp knife. In the food processer, add corn kernels and green chilies and pulse 4 times till it becomes coarse mixture. Keep aside. In a large bowl, add processed corn mixture, besan, cilantro and all dry spices. Mix well. Do not add water or it will make the batter runny. Heat cooking oil in a frying pan. 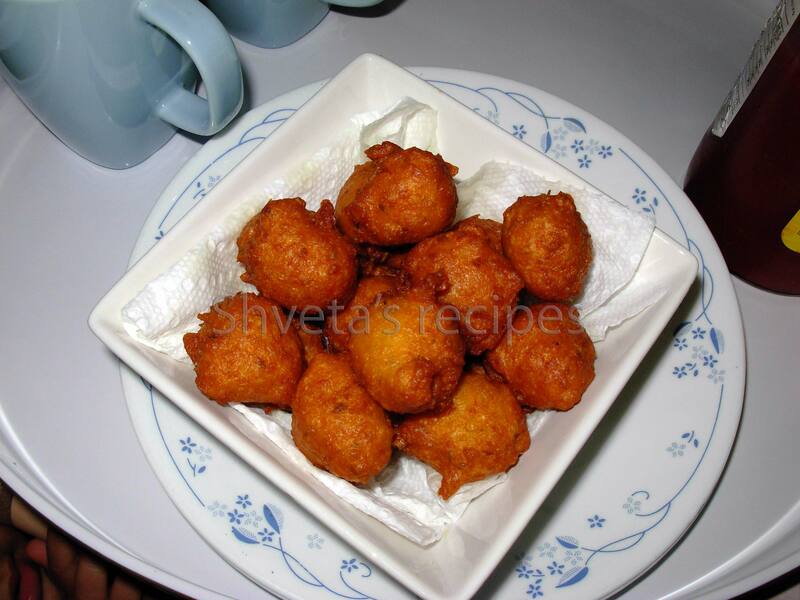 Drop fritter batter by spoonfuls into the hot oil, and fry until golden. Drain on paper towels. 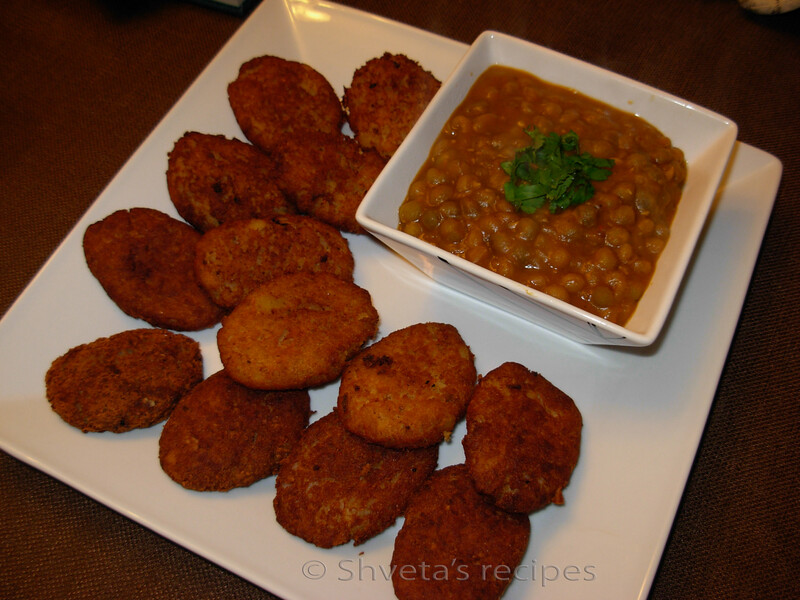 Sprinkle chaat masala on the fritters and also add some lemon juice. Serve immediately. 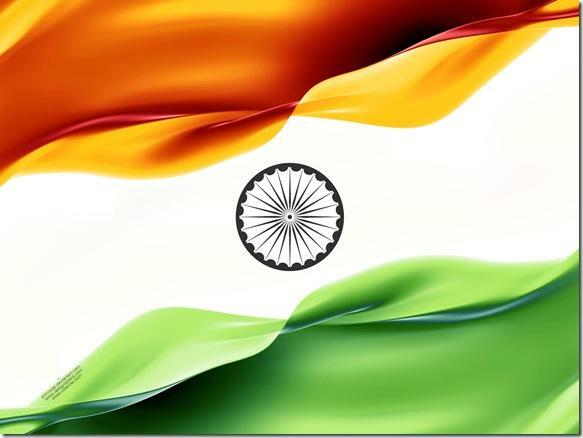 Enjoy with green chutney and a cup of hot tea. 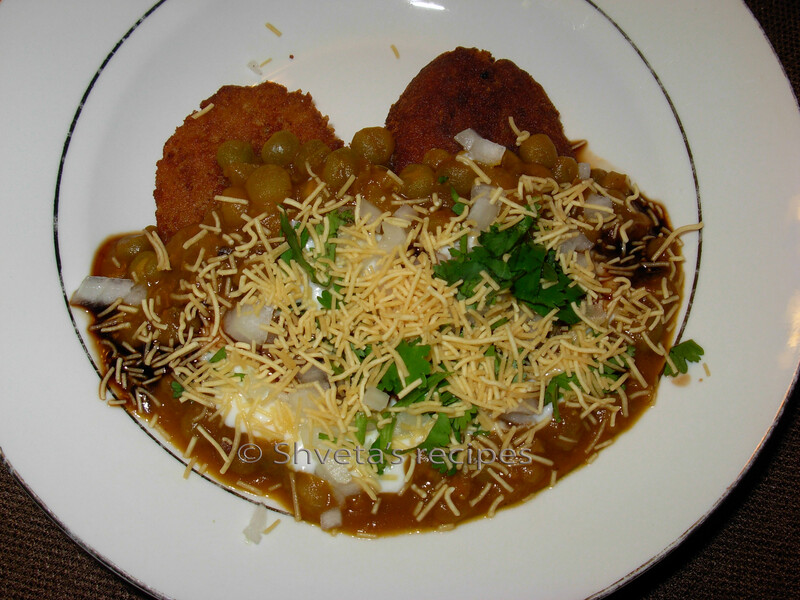 Note: You can also make chaat of these fritters, just add green chutney, tamarind chutney, finely chopped sweet onions, finely chopped tomatoes, chopped cilantro, nylon sev and some chaat masala. Viola! Chaat is ready.